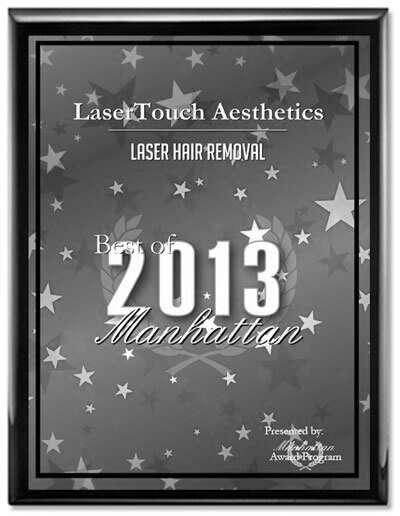 We simply offer the best laser hair removal service in New York City. We have nearly 10 years of experience with laser hair removal and our laser devices, offer the most effective variety of laser technology, exercise a proprietary safety protocol, utilize nine laser units for hair removal, and stand behind our services. At LaserTouch Aesthetics, the first step towards FREEDOM OF A HAIRLESS BODY is a free consultation, during which, an experienced laser cosmetician will evaluate your skin type and identify the appropriate treatment procedure. Prior to a consultation, LaserTouch representatives will ask you to fill out certain forms to ensure that you do not have any medical conditions that would prohibit you from receiving laser treatment. During the consultation, which may take 15 to 30 minutes depending on questions you may have, our laser cosmetician will describe the treatment process, what to expect during treatment, pre-treatment requirements and post-treatment procedures. Following consultation and preparation of the treatment area, the technician will adjust the equipment to provide you with the most effective treatment. The hair that gets removed during a treatment is that hair which is in its active growing phase (human hair is not always growing). Usually, that is about 10% - 20% of the hair in the treatment area. Hair follicles in their active growing stage will die and fall out in 2 to 10 days. Depending on the treated body area, we will wait 6 to 8 weeks for your next treatment. This period allows a meaningful amount of the remaining hair to move into the active growing phase so that your next treatment removes the maximum amount of hair. Therefore, most clients will need 4 to 8 treatments to achieve maximum results. 1. 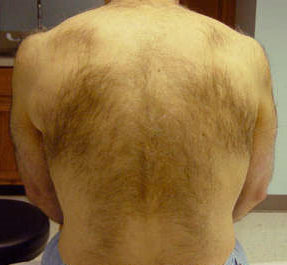 The treatment area needs to be shaved to skin level , although a days hair growth may be necessary and helpful so that the area that requires treatment is easily recognizable. 2. You must avoid waxing, plucking, threading or electrolyses of the hair for 4-6 weeks prior to treatment. The laser needs the hair at skin level in order to effectively destroy the hair follicle. 3. Avoid the sun exposure for 4-6 weeks prior to treatment. The lighter skin allows more energy to be delivered to the target. A "skin" bleaching cream such as Hydroquinone may be started 4-6 weeks before treatment in order optimize results. Please consult with a LaserTouch Aesthetics technician before such treatment. 4. Be sure that the treatment area is fully washed off and has no makeup, medication etc. 5. Be certain that you are not on medications such as Accutane, Retin-A, Gold Therapy etc, at present or within the past 6 months. These medications, and several others, can make your skin susceptible to damage from the laser. If in doubt, please ask us for a list of the aforementioned medications. 6. Laser treatments for hair are not recommended if you are pregnant. 1. Avoid bathing or washing with very hot water, Use tepid water. Wash gently. Keep the area clean. 2. Do not shave the treated area for at least 4 days after treatment. 3. Avoid any irritating medications or chemicals. Examples of these are Retin-A, Benzoyl peroxide, glycolic acid or astringents. 4. Avoid direct sun exposure for at least 3 weeks after treatment. Protect the area with a sunscreen of higher than 30 SPF or else the skin may develop hyper-pigmentation/hypo-pigmentation marks. 5. The treated area may become pink, red, inflamed, or even blistered within 30 minutes and in rare instances last several hours to several days. Regular application of ice, cooling gels, Hydrocortisone or Neosporin is important for relief. 6. Do not wax, pluck, thread or use depilatories for the hair that grows back. 7. After laser treatment, hair may continue to grow out as if it were never treated. Typically this will occur for about 2-3 weeks and then those treated hair will simply begin to fall out. 8. Generally it is best to wait 4-6 weeks between treatments. There is no advantage to scheduling your visits closer together even if you do not see immediate results. The laser only targets hair in the growth phase. The next growth phase is generally in 4-6 weeks. Conventional hair removal, shaving, waxing or depilatories, have been time-consuming and have provided short term results. With the early laser technology, effective hair removal was possible but was expensive and painful. Now, with newer technology, affordable and comfortable laser hair removal in New York City is possible. Treatments are safe, simple, and quick, with virtually no side effects and minimal discomfort. Although laser hair removal in New York City has been available for nearly a decade, within the last couple of years the technology has improved dramatically. Laser Hair Removal can now be done quickly, safely, effectively and comfortably. You may see significant hair reduction of up to 85% to 90% after four treatments. Using the world's most advanced and powerful lasers, Candela's GentleLASE® and GentleYAG, Cynosure Elite, Cynosure MPX and Cutera Xeo, LaserTouch Aesthetics provides safe, affordable, fast and efficient hair reduction in Manhattan. FDA cleared for hair reduction, our lasers reduce ingrowns in all skin types, including tanned skin. Although laser hair removal in New York City has been available for over a decade, within the last couple of years the technology has improved dramatically. Laser Hair Removal can now be done quickly, safely, effectively and comfortably. You may see significant hair reduction of up to 85% to 90% after several treatments. We offer an array of the latest, most effective and safest equipment, operated by our licensed practitioners specializing in laser hair removal and other cosmetic procedures. At LaserTouch Aesthetics we feature multiple laser's including the FDA approved Candela's GentleLASE® and GentleYAG, Cynosure Elite, and Cutera's Xeo. These devices provide optimal solutions for laser vein treatment (spider veins), laser genesis, sun-spots, freckles, age spots, Intense Pulse Light (IPL) applications and ingrown hairs. We are committed to offering our clients the most advanced, most effective, and safest technologies for laser hair removal and laser treatments. The GentleLASE® and GentleYAG by Candela, Elite by Cynosure and Xeo by Cutera are considered to be leading technologies in laser hair removal. The GentleLASE® is a revolutionary long-pulse high energy alexandrite laser that emits a gentle beam of light that passes through the skin to the hair follicle where it is absorbed. The laser energy is transformed into heat with destroys the hair follicle leaving the surrounding skin unaffected. The Cutera Xeo and GentleYAG effectively treat all skin types, including TANNED SKIN and DARK or AFRICAN AMERICAN skin types, offering unmatched treatment capabilities in HAIR REMOVAL, LEG VEINS, WRINKLES and SKIN TIGHTENING. The GentleLASE® features the patented Dynamic Cooling Device (DCD) that sprays a fine mist of cryogen prior to each laser pulse. This device minimizes pain, protects the skin, and enables the laser energy to gently reach and treat hair follicles. Unwanted body hair is safely removed without damaging the delicate pores and structures of the skin. Facial and bikini areas are usually completed in less than ten minutes; legs, backs and larger areas can take longer. The root of the hair is targeted so specifically that it not only eliminates very dark and coarse hair, but it is the most effective technology for the removal of fine hair and even hair with a light brown root. advantages and cost of laser hair removal? Laser hair removal has many advantages over other hair removal methods, including efficiency, cost, and results. 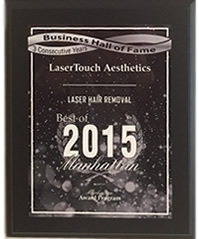 LaserTouch Soho, as the best-in-class laser hair removal and medical aesthetics center provides all of these advantages and more. EFFECTIVENESS: Laser hair removal is proven to significantly reduce hair. In most cases, hair is reduced by 85-90% after six treatments. The lasers we use are FDA approved and have been evaluated as the most effective in peer-reviewed medical journals. These sophisticated lasers target the root of the hair so specifically that they not only eliminate very dark and coarse hair, but are also the most effective lasers for the removal of fine hair and even hair with a light brown root. Click here to reach scientific reports and studies on the effectiveness of laser hair removal. AFFORDABILITY: We never insist on paying for packages up front, our clients can pay per treatment. We are confident that our lasers' great results will bring our clients back for completion and follow up treatments. Cost is determined by the size of the area, hair type, thickness and other factors. It is best to come in for a complimentary consultation to hear about our prices. EVALUATIONS and CUSTOMIZATION: Before, During & After: Your safety and satisfaction are our primary concerns. Our laser practioners perform test spots and assess hair and skin types for treatment eligibility. We thoroughly review every client's skin type and hair color to determine customized treatment settings before and during the treatment. TRUTHFULLNESS: No False promises. We explain what works and what doesn't. Our first priority your health and your satisfaction and therefore we educate you about your skin, our services, and the best options to achieve your goals. CONFIDENTIALITY: Our laser providers and professional staff understand the intimate nature of laser hair removal and are accustomed to addressing our clients' most private concerns. You can rest assured that anything discussed or treatments performed at LaserTouch Aesthetics will remain discreet and confidential.